Don’s contribution to the Victorian and Australian genealogy world is considerable and has been well documented – co-founder of the Australian Institute of Genealogical Studies (A.I.G.S), long time member of the judging panel of the Alexander Henderson Award, first Vice President of the Australasian Federation of Family History Organisations in April 1979, member of Australasian Association of Genealogists and Record Agents, committee member of the Victorian Association of Family History Organisations and acknowledged annually by the Don Grant Lecture from 1997. 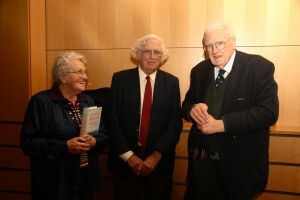 Don was thrilled to be able to attend Family History Feast in person in 2010 and to meet Professor Geoffrey Blainey who gave the Don Grant Lecture last year. Don began his working life at the State Library of Victoria and always spoke fondly of those early years. He loved the Library and had a superb knowledge of Library collections, especially those of family history relevance. I was on the judging panel of the Alexander Henderson Award for three years with Don. We were also both members for about a year of the Gippsland Historic Cemeteries Committee coordinated by Heritage Victoria and chaired by Don. This meant road trips to a number of places in Gippsland, including Warragul, Bairnsdale and Traralgon. This was when I really got to know Don and learnt of his work at the Library and of his later career with Public Record Office Victoria. Don had so many stories, wonderful reflections on family history, his schooldays at Melbourne Grammar and on the V Line train trips to the city from his country home. Don was always a strong supporter of the Library’s Genealogy Centre and friend of the Genealogy Team. In February 2004 he was a member of the inaugural Genealogy Centre User Group. We will miss Don’s quiet humour, his thoughfulness and wealth of knowledge. A true gentleman and genealogist.